Milo, member of Scribble Jam champion Nocando's label Hellfyre Club, is the latest breakthrough in abstract hip-hop. You may be questioning yourself, "Abstract hip-hop? What on earth could that possibly imply? ", but after listening to any of his 5 acclaimed releases, it will soon become strikingly clear. His music has been dubbed by Rate Your Music as being a part of the rap sub-genre 'nerdcore', and with track names such as 'Sophistry and Illusion' and lyrics based around 'boiling the elements down into the axioms', it is evident that Milo clearly isn't your generic rap artist. Cavalcade is a mixtape that showcases the self-reflective and mindful lyrics that truly epitomise Milo, and although I have thoroughly enjoyed every piece of work since his debut album I Wish My Brother Rob Was Here, I feel like his lyrical adeptness and general artistic awareness have evolved dramatically over the past two years and have harmoniously mingled together to create one of the most conceptual mixtapes of 2013. This 'awareness' comes through well in the first track, 'Geometry and Theology', which contains a thought-provoking concept from the late Ludwig Wittgenstein in the opening minute about the origins of language, and then transitions to a dreamy spoken-word verse that flits between themes of the generic fangirl on Twitter and the Book of Ezekiel in the Old Testament. It sounds like it should be an awkward mish-mash of trivial nonsense, but in reality, it works so perfectly well. 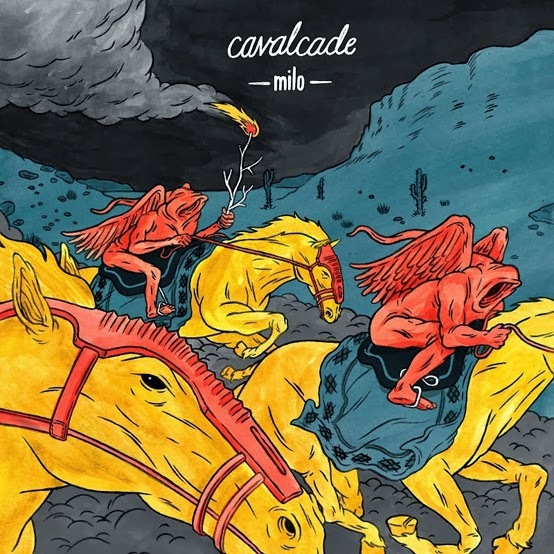 Although none of the tracks on Cavalcade reduced me to tears like 'The Ballad of Mermaid Man and Barnacle Boy' on the EP Milo Takes Baths so very nearly did, producer Riley Lake's airy, dream-like production really creates an overwhelming atmosphere; the samples from America and shadowy drum beats fluctuate between creating a quiet, ambient atmosphere and a strangely pleasant harsh one. All in all, Cavalcade marks the beginning of a promising career for Milo, and I am thoroughly intrigued as to whether he shall continue in this direction on future releases.